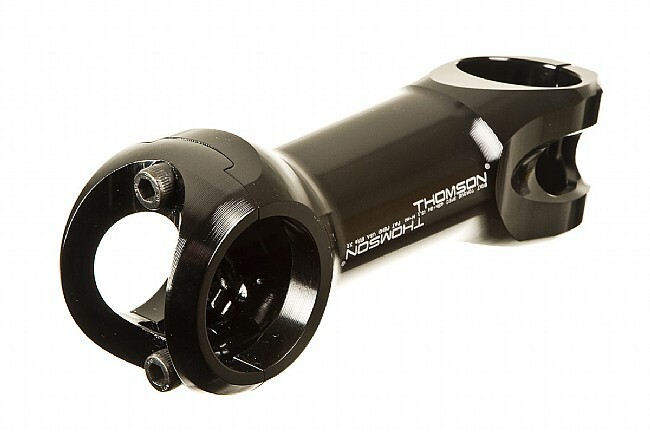 Finely tuned design with an impressive 50g weight reduction over the Elite Road stem, the Thomson X2 Road remains one of the lightest, strongest options in the industry. When I replaced a 110mm Bontrager stem on my road tandem with a 120mm Seven Cycles stem I noticed a lot more flex in the front end of the bike. The fit was better but I was never happy with the flex. After narrowing down the search to this and one other stem I decided to go with the Thomson as my mountain tandem also has an X2 on it as original equipment. I used the tool here (httpyojimg.netbikewebtoolsstem.php) to compare the fit since I was replacing a 6 degree stem with a 10 degree stem and found that by mounting the steeper Thomson one spacer lower I would achieve almost exactly the same handlebar position. I had to buy additional spacers because the stack height of this stem was lower than the one I was replacing. Based on some reviews I've read I'll keep an eye on the face plate to make sure no cracks develop, but the stems seem very well built. This is for my gravel bike, a 2014 Kona Rove titanium multi-surface bike, I've never had an issue with any Thomson stem and I've used both the Elite and the X2 on many bikes including MTB, CX and road and even though Thomson does, I've never distinguished between road and off road products. It looks great, it works great. Thomson makes the best Alu stems! This is my second X2 stem. I got the 10 degree black and it looks wicked reversed. The 2 bolt pattern provides plenty of bar grip without pinching. I previously used one on my race bike Cervelo R3 with carbon bars and liked it so much that I decided to throw it onto my secondary roadbike. It looks beautiful with a set of Thomson bars. I realize that many weight weenies will complain about the weight, but this is a beautifully machined piece of art with unbelievably amazing strength/stiffness. Considering the quality of the stem it is an unbelievable bargain. I also own the Thomson Masterpiece seatpost which is equally great. 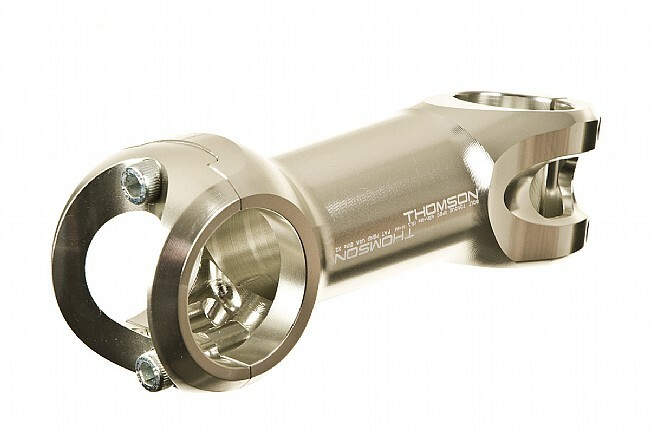 Many high end builds end up with Thomson stems and posts. Why? Functionality, quality, aesthetics and durability! Ultra Light and very nice. I purchased the 17 degree model and it has been great. I have not experienced any problems with this stem. I like the angle and length. I did my research before buying and am happy with purchase. It also looks good with my thomson seatpost. Nicely made stem with a nice choice of rise for better fit. That said, I'm not a fan of the two bolt handlebar clamp. I have a high quality torque wrench and carefully checked the tightening per the spec. I did have the lower bolt loosen to the point where it could have gotten really scary at some point and I'm surprised it didn't lead to a crash. I would like this stem to have a four bolt handlebar attachment point where it is unlikely that 2 or 3 bolts would all loosen. The 2 bolt system Thomson uses has less redundancy. The x2 Thompson stem is rigid, even though it is relatively light, and the way it wraps the bar ensures there are no pinch points to damage light weight bars. One interesting update is the move to smaller M3 bolts instead of the M4 bolts used on earlier versions. I am not sure it changes the weight but it will help reduce the chance of over tightening. For the price, the clean look and the quality I am not sure there is a better stem around. Excellent workmanship- but be sure to tighten bar clamp bolts precisely and carefully to recommended torque. Using a click-type 25-25- ion-lb automotive torque wrench set to 45 resulted in under-torqued the bar clamp bolts and I experienced some bar rotation during rides. Strongly suggest using a Park TW-1 beam-type wrench (or equivalent) for precise tightening to the recommended 45 in-lb. Thomson suggested that the automotive ones may not be accurate at the low and high ends of their ranges. A beautifully forged and to my eyes, elegant piece of gear. 13 of 19 customers found this review helpful. No one needs a lighter or more expensive stem. Take a good look--the pros use aluminum bars, stems and seat posts because the carbon ones BREAK from time to time and they have weight limits. The lightest stem is only about 20-30g lighter, so if you weigh more than 120lb, forget it. Thomson stuff has this weapons-grade, NASA spec quality that might actually make the rest of your bike look crappy. Looks great on an unpainted Ti frame. 4 of 16 customers found this review helpful.